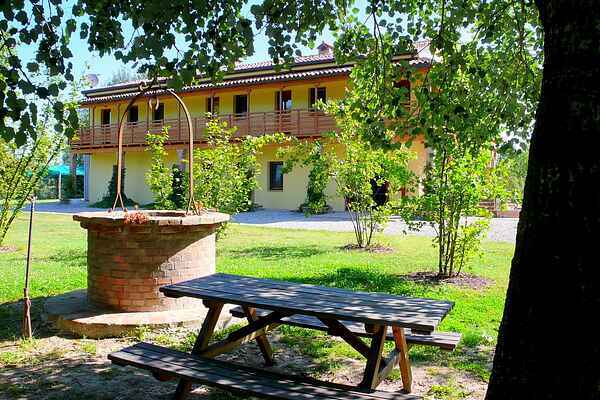 The farmhouse is set in countryside between Ferrara and the Adriatic Coast. Ferrara is 19 km away and the coast is 35 km. The farmhouse complex is between two delightful, small lakes. This is a superb area to enjoy both an active and a relaxed holiday. The lakes were created in the old banks of the River Po. There is a necropolis in the grounds of the farmhouse complex. These ancient Roman graves can be viewed in Castello del Verginese. This is next to the complex. Lake Tramonto has a shoreline of 2.2 km. It is perfect for swimming thanks to its clean water. There are five new apartments with terrace and beach at Lake Tramonto. The apartments are simply furnished. The kitchen has a two burner electric hob. An eco-friendly system draws water from the lake. This keeps the apartments cool in summer. Lake Alba has a shoreline of 1.6 km and is suitable for fishing. There is a restaurant and a number of other apartments here. You can enjoy diving in both lakes and you can explore them in a pedalo. The farm grows apples and pears. You can buy apple juice, apple vinegar and delicious jam. You can enjoy day trips to Treviso, Padua, Bologna and Ravenna. You can also enjoy a relaxing day on the beach.